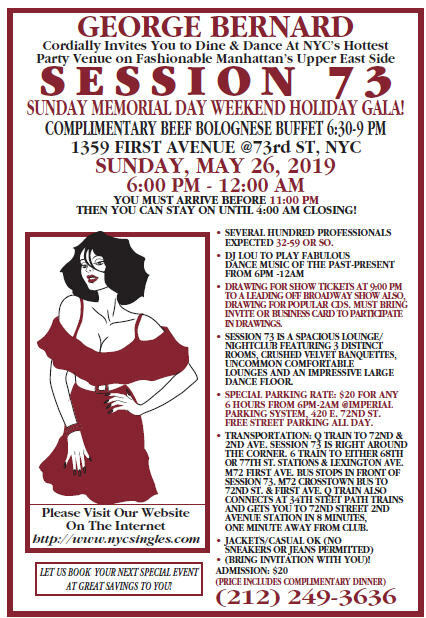 DINE AND DANCE FROM 6-12 AM AS YOU JOIN US ON A SPECIAL SUNDAY, MAY 26, 2019 A SUNDAY, MEMORIAL DAY WEEKEND HOLIDAY GALA AT SESSION 73 NIGHTCLUB WHERE THERE IS NO WORK THE NEXT DAY. SESSION 73 IS ARGUABLY THE HOTTEST, TRENDY EASTSIDE NIGHTSPOT IN NEW YORK CITY. SESSION 73 IS LOCATED AT 1359 FIRST AVENUE @73RD STREET AND IS NOW EVEN MORE ACCESSIBLE WITH THE PRESENCE OF THE NEW 2ND AVENUE SUBWAY AND THE HIGH-SPEED Q TRAIN THAT TAKES YOU TO 72ND ST & 2ND AVE, JUST AROUND THE CORNER FROM SESSION 73. IN FACT, WE’RE OFFERING A COMPLIMENTARY AND SUMPTUOUS BEEF BOLGNESE AND FRESH VEGETABLES ALONG WITH GREEN SALAD BUFET DINNER WHICH WILL BE SERVED 6:30-9 PM. PARTY IS 6-12 AM. A SPACIOUS LOUNGE/NIGHTCLUB FEATURING 3 DISTINCT ROOMS, CRUSHED VELVET BANQUETTES, UNCOMMON COMFORTABLE LOUNGES AND AN IMPRESSIVE DANCE FLOOR. **** WIN SHOW TICKETS TO THE NEW ELECTRIFIED MUSICAL “SINCERELY, OSCAR” CELEBRATING BROADWAY’S GREATEST LYRICIST, OSCAR HAMMERSTEIN. THERE WILL BE A SECOND DRAWING OF LEADING MUSIC CDS. TO PARTICIPATE IN THE DRAWINGS, YOU MUST BRING YOUR INVITATION OR BUSINESS CARD. **** AND IN ADDITON TO THE FABULOUS Q TRAIN, WHICH DIRECTLY CONNECTS WITH THE PATH TRAINS, TRANSPORATION IS EASY: 6 TRAIN TO EITHER 68TH OR 77TH STREET & LEXINGTON AVENUE STATIONS. M15 FIRST AVENUE BUS STOPS IN FRONT OF SESSION 73. M72 CROSSTOWN BUS ALSO STOPS @ 72ND ST & FIRST AVE. ARRIVE EARLY AND PARTY ALL NIGHT LONG.